Most startup and emerging small businesses are fairly unconcerned about human resource functions in their company. In fact, some entrepreneurs have a sense that human resources are all about strict guidelines, red tape, and ridiculous rules enforced by the HR Police—all things that could impede the growth and dynamics of a fast-growing company. But even start-ups need HR and ignoring your "people processes" could cost you profitability. Use the simple form below to download your free white paper. You can't ignore your company's people processes. Enter your information below to be redirected to the download page. Yes, send me occasional helpful tips via email. "The heartbeat of every great company is its people. 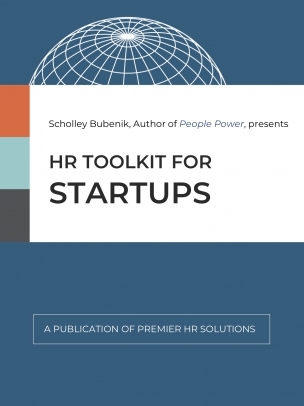 Scholley Bubenik proves that hiring and managing the best doesn’t have to break the bank. Follow the practical advice in People Power and you are sure to build an impactful organization." Scholley Bubenik has over twenty years of senior management experience. She has a Master’s Degree in human resource management and has helped numerous companies in multiple industries establish human resource departments. She is a Forbes contributor and writes about employee engagement, retention, hiring and recruiting. Her most recent book, People Power: An Entrepreneur's Guide to Managing Human Capital, is available on Amazon. © 2018 Premier HR Solutions. All Rights Reserved.